If you are like many businesses that run multiple applications designed with industry specific functions or niche solutions, then it is time to increase productivity with enterprise application integration. TopManage Flute Player unifies all operating systems with a single source of information and ensures that decisions are based on real-time, accurate data. Flute Player optimizes and integrates heterogeneous system environments, including SAP software, point-of-sale, payroll, CRMs, ERPs, B2B systems, flat files, and any other third-party application. Flute Player enterprise application integration (EAI) enables businesses to seamlessly share data in real-time from multiple generations of technology in heterogeneous system environments. This enables businesses to automate processes, streamline mission-critical operations, and create customized workflow. Moreover, enterprise application integration increases efficiency, improves customer service, and reduces cost of ownership for data-centric system architectures. As each business’s needs are different, Flute Player is designed to be extremely flexible and can be tailored to your specific business needs. Flute Player is even able to integrate your ERP with your partner’s or vendor’s system, to allow a seamless transfer of data between both systems. 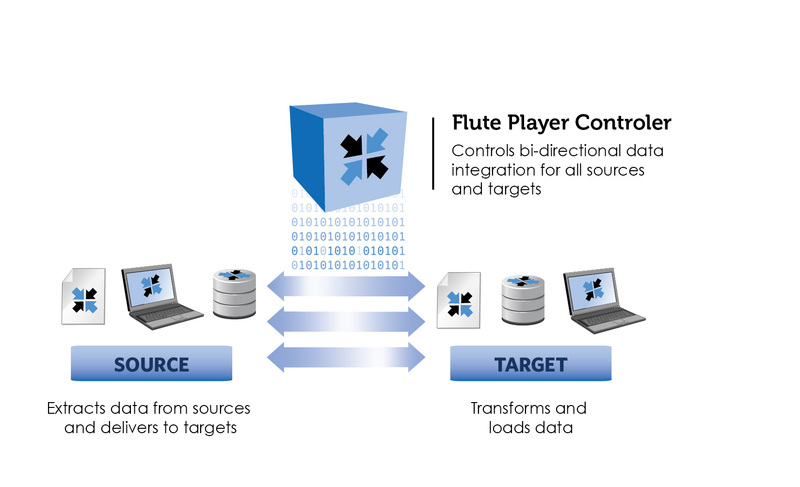 Flute Player controls all defined applications and services acting with semantic interoperable agents that communicate and exchange information independent of a specific programming language or operating system. Agents automatically interpret exchanged information accurately and provide end-user applications with functional data in the required format. Flute Player agents send, transform, and receive messages according to rules set within the Flute Player console. Each agent’s rules, or application integration functionalities, are not inherently part of their structure, but rather they are modeled as services controlled by Flute Player. Flute Player provides high-performance data transformation and delivery among enterprise platforms. Its capability to extract, transform, and load a high volume of data via independent agents creates a flexible, scalable, and adaptive integration architecture. Flute Player acts as message-oriented middleware (MOM) that controls semantic interoperable agents and supports asynchronous delivery of messages between applications. The asynchronous delivery facilitates a message queue which protects data from being lost during intermittent connectivity while in the process of being delivered. This effectively creates an application integration environment which does not require all sources and targets to be connected to the network at the same time. For example, if the receiving application fails or loses connectivity, the sending application will continue to deliver messages (data) which are stored in the message queue until the receiver is ready. Furthermore, as a Web-based data integration controller, Flute Player can also create a service-oriented architecture (SOA) where Web based applications can easily be integrated via Flute Player agents. The Flute Player Web-based application integration console simplifies data integration and provides easy-to-use mapping tools for message transformation. Flute Player facilities the transformation of messages en-route according to defined sender and receiver requirements set in the Flute Player console. This means one application can send a message in its own native format and the target application(s) can receive the message in their own required format. Flute Player’s user-interface improves visibility and management capability with a detailed dashboard and customizable reports. Flute Player allows the developer to manage and monitor all operations, sessions, errors, reports, and more. The flexible framework and point-and-click user interface help improve application integration productivity and lower development costs. Most businesses position their ERP as the backbone of business operations and the center of transactional information. For this reason it is critical to integrate the ERP, whether it is SAP or another software provider, with all sources of business information, logic, and functionality so validations and decisions are based on real-time accurate data. When systems are not integrated, but instead are synchronized and allege integration, duplicate information is created leading to inefficiencies and errors. Flute Player produces real-time ERP system integration and ensures there is no data duplication by providing a single source of information on one database.